The new look Piano Room at the Majestic Hotel in Harrogate. The details behind the ‘exciting’ £15 million plan to transform Harrogate’s ‘grand old lady’ into a Doubletree by Hilton have been revealed. The team behind the Majestic in Harrogate. Built in the turn of the 20th century the Majestic Hotel on Ripon Road, is as much a part of the heritage of this town as the Royal Hall, Crescent Gardens and the town centre monument. But the Grand Old Lady’, which has stood the test of time against two World Wars and two significant fires, is about to join forces with one of the biggest names in the global hotel industry. After purchasing the Majestic in 2016, Newcastle-based leisure leader, the Cairn Group has committed £15 million to ‘sympathetically’ refurbish the hotel to Hilton standards. Vince Garrington, General Manager of the Birmingham Conference and Events Centre, has been drafted in to make sure the transformation runs smoothly. The Majestic Hotel in all its glory overlooking Harrogate. Mr Garrington said: “While we are a UK wide company, we’ve got a very local mindset. “This is the Majestic and it’s always going to be the Majestic, we’re the custodians, Fredericks Hotels started it in 1899 and he opened it in 1900. “Through those years it’s had different custodians but the Grand Lady of Harrogate is still here, it’s just our turn, and we owe it to the building. “The only negativity we have received nationally is ‘I hope you do it sympathetically’. “We feel a little bit hurt when people suggest that we as the Cairn Group wouldn’t be sympathetic to the building. Within its 33 hotels nationwide, the Cairn Group has a portfolio of ten ‘unbranded’ properties known as the Cairn Collection, which includes the likes of Redworth Hall in County Durham and, until now, also included the Majestic. Explaining a bit more about the process behind the partnership with Doubletree by Hilton, Mr Garrington said: “When you look a Redworth Hall you wouldn’t put a brand on it, it’s a beautiful country house hotel sitting in the grounds of a 17th century estate, it doesn’t need that brand behind it, it doesn’t add value. “But here the Majestic is different. The thought process you have to go through is, what is going to be the right thing to do for this business individually. 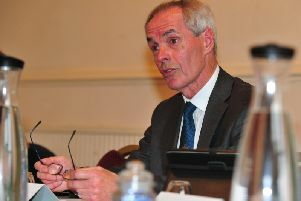 Mr Garrington revealed that the race to partner with the Majestic was whittled down to two major international brands, but could not say which global player had lost out. With the decision final, the hotel is already undergoing renovations, working alongside Hilton’s branding team, to ensure that it ‘ticks all the boxes and complies with the brand standards’ explained Mr Garrington. The bedroom refurbishments started in March, the reception area is expected to be complete in a few weeks, Christmas party bookings are already being taken for the Carriage suite and it is anticipated the whole project will be complete by next May. For general manager of the Majestic, Matthew Hole, the exciting investment is an opportunity to put Harrogate on ‘the international stage’. He said: “From a purely personal level, I’m just really excited that I’ve got the opportunity in my career to have this kind of money put in. But if you’re questioning how an international market marries up with a close-knit community of strong, independent businesses be assured they’ve covered that too. Mr Garrington said: “Within the Cairn Hotel Group, owned by the Handa family, every hotel is different. “Our Champagne Bar and Grill menus will be different to any other. The Piano Lounge will be totally different, and we will look for that local supply, genuinely. What will the new-look Majestic provide?